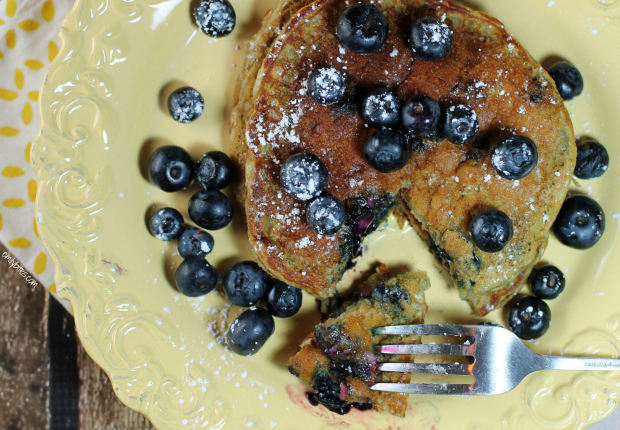 If the thought of hot, sweet, juicy blueberries bursting on your tongue, enveloped by thick, warm, delicious pancakes is at all enticing to you, then you need to stop what you’re doing and make these Blueberry Pancakes ASAP. I’m swooning. You are going to be amazed that two of these hearty, tasty pancakes are only around 150 calories or 4 Weight Watchers SmartPoints. The secret ingredient is Greek yogurt! It may sound strange, but it makes for amazing pancakes and it fills them out for less WW points! This recipe can easily be doubled or tripled to feed your family or guests and it comes together incredible quickly. Just stir together a few ingredients, cook them up for a few minutes and voila! Breakfast Heaven. I didn’t include toppings in the recipe since I know everyone likes to serve their pancakes differently. My favorite for these is a little bit of light butter spread to melt on top (I use Land-O-Lakes), a dusting of powdered sugar, and a handful of extra blueberries. If you warm those blueberries in the microwave for 20-30 seconds first so that they burst when your fork hits them, even better. In a large mixing bowl, combine the yogurt, egg and honey and stir until well combined. Add the flour and baking soda and stir together until a batter forms. Add the blueberries and gently mix into the batter. Mist a griddle pan with cooking spray and bring it over medium heat. Scoop a scant ¼ cup of batter onto the heated pan and use the back of a spoon to smooth it out into a flat(ish) circle. Repeat in batches (depending on how many pancakes fir on your pan at once) to form 6 pancakes. Cook on one side for 2-4 minutes until bottom is golden and pancake is “flippable.” If the batter is not firm on the bottom yet it needs more time. Once flipped cook another 1-2 minutes until golden on the other side as well. Repeat until you have 6 pancakes (pancakes in later batches may cook in less time). How many does this recipe make…unsure of how big the 2 pancakes are. Thanks! The recipe makes 6 pancakes! Oops! Just reread it and it says 6….sorry! Thanks! Thanks for all the great recipes! I LOVE pancakes. I don’t like blueberries so I am going to make this with banana cream dannon greek yogurt and bananas instead of blueberries. I may need to toast a few pecans to go on top 🙂 YUMMY! MMM – looks so good. I just put some dannon yogurt on my list but I only get the vanilla (and then add fresh berries to it)…will venture out and try something new :o) !! I recently tried a blueberry chia jelly recipe from a blog where she took 2 cups of berries (frozen is fine) 2 tsp of chia seeds and 2 tsp of honey and cooks it a few minutes until the berries burst and the sauce thickens. My new obsession…I use that on top of my protein pancake, swirled into some greek yogurt (the plain kind – I have to something sweet mixed into it – wish that I didn’t), even use it on peanut butter and “jelly” on toast. I have tried it with strawberries and raspberries too but the blueberry was my fave. I made these today. Seriously could be the best pancakes I have ever made. So easy to make and they turned out perfectly. As a bonus they were also so perfect looking. You put together another yummy one for us!! Thank you. Just made these and they were delish! I followed the recipe exactly and only got 5 pancakes out of them but that’s okay. I think next time I may add a slash of water to the batter because it was very thick. Other than that they were really good, thanks. Hi Emily! I made these this morning, and they were great. I didn’t have blueberry yogurt, so used Yoplait Greek 100 Lemon yogurt, and that worked well with the fresh blueberries. Thanks for the recipe! I really enjoy your site! Yum, I love lemon and blueberry together! I made these and they tasted great, but the batter was VERY thick and would not spread out on the griddle. I added some water to the bowl after the first two and it was better. Mine also came out quite gummy–maybe I had the heat too high? You definitely have to spread the batter out with the back of your spoon, it will not do it by itself. Not sure about the gumminess, mine didn’t seem gummy! I’ve made many of delicious recipes from numerous healthy sources. However, this one is the WORST! Don’t waste your time! Hm, not sure why you feel that way, this is one of my favorite recipes! Made these this morning…another winner from Emily! Not a bad substitute for traditional blueberry pancakes, one of my favorites, and at 150 calories for 2 pancakes, I was contently full! Kudos Emily! I made these this morning. I was skeptical they would turn out by looking at the ingredients, but thought I’d give them a try anyway because I had all the stuff and I really wanted pancakes. They surprisingly turned out well! Were they the best pancakes I’ve ever eaten? No, but this recipe definitely satisfied my pancake craving, and it didn’t feel like I was eating “diet” pancakes. My husband liked them as well, and he is rarely satisfied with my WW recipes. I did add a splash of unsweetened almond coconut milk to mine because the batter was extremely thick. Going to try the suggestion above with the lemon Greek yogurt next time. Thank you for the recipe! Can we use reg yogurt or does it have to be Greek? I’ve never tried it with regular yogurt – if you do, let me know! I made these tonight … They were yummy! The batter was thick but I added some water to make a little more runny. I used bananas for the fruit (hubby doesn’t like blueberries) and added a few walnuts and chocolate chips. I know that’s not totally healthy but I didn’t add a lot and they were delicious! I didn’t get 6 pancakes and I even measured! I’m not sure what I did wrong? 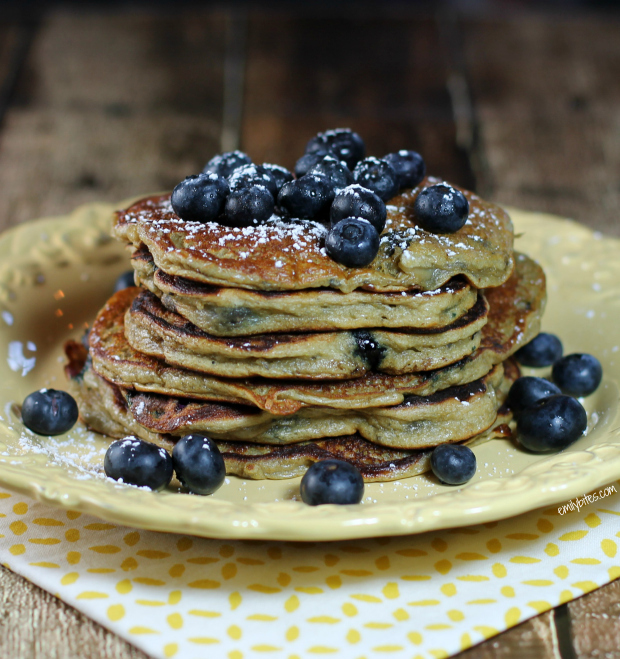 I just made your pancakes this morning and they are soooo good! I love adding yogurt to pancakes! Thanks so much for giving us this recipe. I’ve had many of your recipes and I’m very much looking forward to trying these. I’m using whole wheat flour instead of white whole wheat flour. Will I have to change the amount of flour I use? I made these a few weeks ago and I love them. This weekend I tried them with strawberries ( I just replaced the blueberry yogurt with strawberry and the blueberries with strawberries) Amazing!! I can’t wait to try other combinations! Thank you for a great, easy recipe! I used the Fage brand nonfat blueberry yogurt. It is probably thicker than the dannon. The taste was awesome. But cooking was a challenge because the batter was too thick. Should I have added some water to the batter? What is the appropriate consistency of the batter? The batter for these is thicker than normal pancake batter as it is yogurt based rather than water based. You can use the back of a spoon to spread the batter into a circle on the pan or you can certainly try adding some water if that’s your preference! These are the best pancakes! I love how versatile they are– I think to date I have made them with blueberries, strawberries, blackberries and bananas and each batch was amazing!! I usually whip up a few batches at a time and pop them into the freezer to eat later and they still taste great! Thanks for the amazing recipe!!! These were delicious. Thanks for creating such yummy recipes and still keeping the points plus values up! I also wanted to say thanks for keeping up with the changing points values! I have made this recipe twice now and it’s great! I switched out the Greek yogurt for 2/3c plain 0% Balkan style, and I think it actually worked better. It thins out the batter just enough that the pancakes spread out on the griddle the way you expect a buttermilk pancake recipe should. I am tasting baking soda, so I may knock it down by half next time.